"At no time, when the astronauts were in space were they alone: there was a constant surveillance by UFOs. " The world has experienced many UFO mysteries throughout history. There have literally been millions of UFO or "Unidentified Flying Object" sightings in virtually every area of the world. 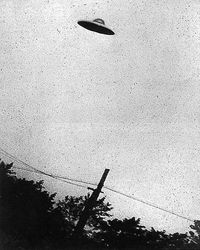 In the year of 1952, the Air Force of the United States established the fact that any object found to be unidentified by experts in investigations on flying objects would be deemed as an "UFO". Throughout the history of the release of this term, individuals who spot something flying in the sky automatically refer to the object as such - even prior to official investigation. Cultural beliefs around the world often associated UFOs to mean a spacecraft operated by aliens, or life forms that are not human. Many mythological stories and even standard folklore tales have surrounded unidentified flying objects. Many religious cults in the United States and other locations of the world have a core belief system that revolves around UFO's. Investigators in the field of studying these crafts are now starting to refer to the mysterious phenomenon as "Unidentified Aerial Phenomenon" or "UAP" for short. Individuals that reside in France, Italy, and other areas such as Spain often refer to these flying objects as "OVNI". Have You Experienced One of the Many UFO Mysteries? The Area 51 UFO mysteries have been very challenging to unravel. The "Black Triangles" are considered to be a unique class description for a group of "Unidentified Flying Objects". Crop circles consist of strange and unusual formations that are typically created in grain based crops. It is believed that a UFO alien invasion is possibly responsible for crop circles that appeared in the UK in July of 2009. Several individuals have experienced dark UFO sightings in the U.S.. The Dropa Stones continue to be one of the greatest unsolved mysteries of the world. The Starchild Skull – A Human-Alien Hybrid Discovery? The discovery of the Starchild skull has plagued the minds of scientists and other professionals for many years. The UFO aliens Greys are described as having skin that is gray in color. The Roswell New Mexico UFO remains to be one of the most legendary on all of UFO lore. If you have experienced one of the many UFO mysteries that have perplexed the minds of even the most dedicated researchers throughout history, we would love to hear from you! There have literally been millions of UFO or "Unidentified Flying Object" sightings in virtually every area of the world. In the year of 1952, the Air Force of the United States established the fact that any object found to be unidentified by experts in investigations on flying objects would be deemed as an "UFO". It does not matter if you have witnessed something unusual in the past, or if the experience was recent, we would love to hear about it! Please include as many details about your experience as possible. High amounts of details are exceptionally useful to readers. We thank you, in advance, for your contribution!